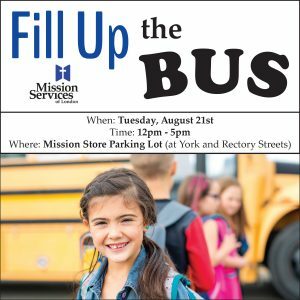 Join us on Tuesday, August 21st from 12pm – 5pm in our parking lot at the intersection of York and Rectory Streets for our annual Fill Up the Bus event! The parking lot is located across the street from the Western Fair Grounds and the goal is to fill a school bus with school supplies for those in need at Rotholme Women’s & Family Shelter. Please be sure to check off the “I would like this donation to go to a specific appeal” box on the donation form and specify “School supplies” on the second step of the donation process.